André Bourvil, one of France’s best-loved comedians, plays it straight as Commissaire Mattei (a role originally intended for Lino Ventura) in Jean-Pierre Melville‘s existential cops and robbers drama. 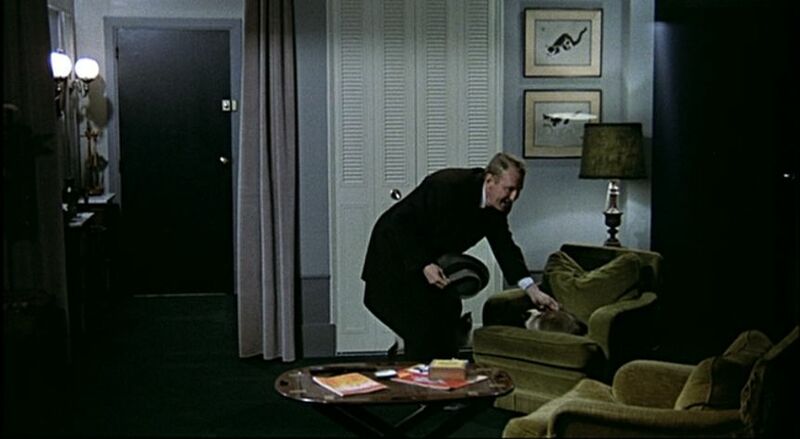 It was to be Bourvil’s last film – he was already terminally ill with Kahler’s Syndrome, a rare form of cancer, and would die, aged 52, on 23rd September 1970 – a month before the film was released. But it’s a smashing performance. Mattei is dapper and meticulous. At the beginning of the film, his prisoner (Gian Maria Volonté) slips his handcuffs on a train and escapes; the Commissaire’s pursuit of him throughout the rest of the film is dogged, professional, unemotional. Meanwhile, all we get to see of his personal life are two almost identical scenes in which he arrives home, greets his cats – their names are Fiorello, Ofrène and Grifollet – and feeds them. Note the cat pictures on the wall. 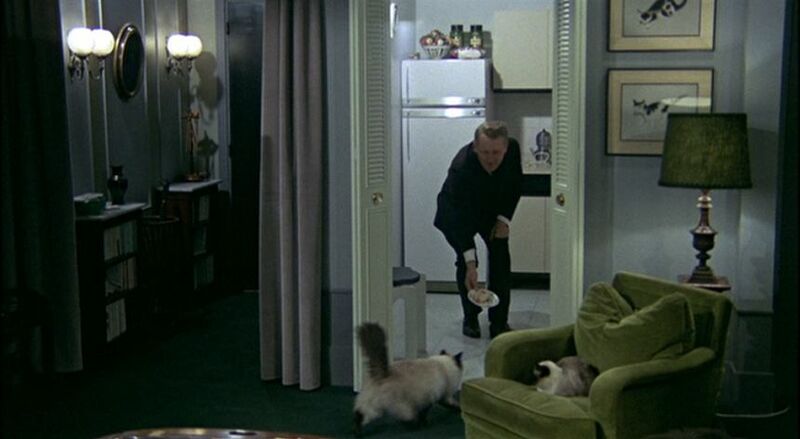 Bourvil fits comfortably into the Melville acting style of minimal emotional display, yet – thanks to these fleeting glimpses of his domestic life – manages to invest his character with a rather unMelvillian warmth. In the Melville universe, the boundary between cops and gangsters may blur – but do you see Volonté and his fellow crooks, Alain Delon and Yves Montand, feeding their cats? No, you do not. It’s clear whose side we are on. This entry was posted in Catpanion and tagged Le cercle rouge. Bookmark the permalink. Thank-you so much for this post! I went to see this film a couple of months ago and it came up in conversation today because I remembered the French cats’ names being so delightful, and have just spent about half an hour trying to find out what they were so I could remember their loveliness properly. I am so happy to have found this page, not just because I now have the names of the cats but also because I’m about to spend the rest of my evening looking through the site for other wonderful cats and their films. Thanks again, and keep doing what you’re doing! Thanks for your generous and encouraging words. So pleased I could help out with the names of the cats in Le Cercle Rouge!